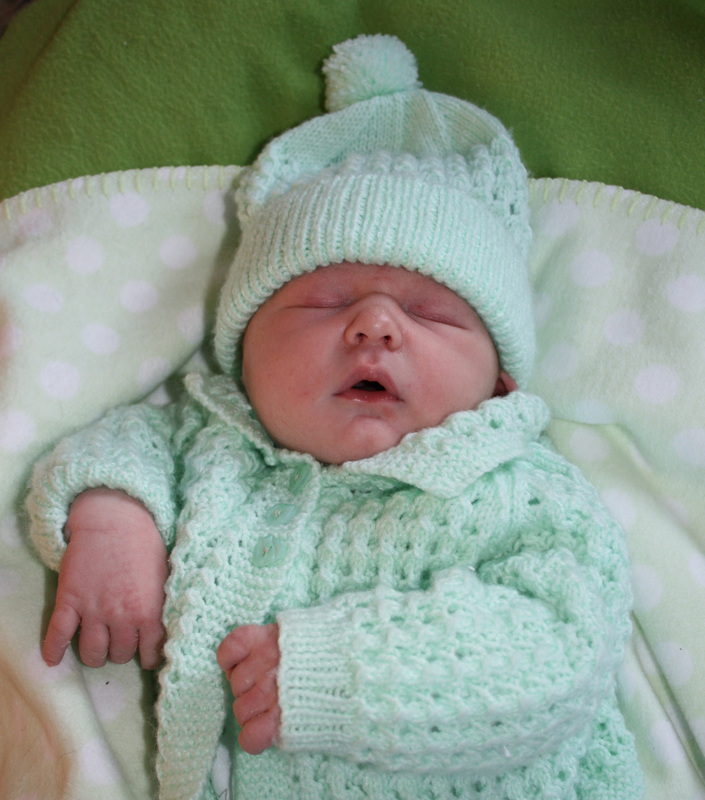 Congratulations Lynda, he looks just lovely and very snuggly in his hand knitted outfit. I really enjoy your blog after being told about it by a friend. All the best for the first few weeks-it is such an exciting (and full on!) time. we have an 8 week old and it’s truly amazing how quickly each week goes by! Congratulations on your wee man, so cute! Welcome to parenthood! All the Best! My heart goes out to you (and everyone in Christchurch). Watching Campbell Live tonight with their caravan of complaints brought tears to my eyes (mind you, the hormones don’t help… I can cry at anything right now!). It’s just heartrenching to see so many people living in limbo down there. So thanks for your kind thoughts about our wee chap. It’s amazing how quickly you become besotted with them. And you’re right, it’s equally amazing how much washing they create! Congratulations! What a handsome wee man. I wonder how long till he has his own little plot of garden and if he will have green fingers like his clever mama 🙂 Enjoy every minute, they grow so fast. Thanks Georgee. I must admit the next few weeks of taking it easy while the c-section heals is going to be hard work – I’m itching to get out into the garden and show the little fella around the farm. What a darling wee bundle of Boy. So precious. I bet he has taken a big hunk of everyone’s heart already. And talking of Hunks – Your Hunk has done very well….. but surely you certainly can take the bulk of the credit!! That wee acorn has had the best of starts, and now we can look forward to watching the splendid Oak Tree grow. Congratulations to you all. He is gorgeous, wait until he starts smiling at you & you will both become even more besotted! I don’t think it’s possible for us to get even more besotted. He already has us wrapped around his little (hopefully green) fingers. To Lynda & Jason Congratulations! !As said before take lots of photos. You will outside showing off the gardens,chicks and other animals on you block before long Lynda. Take Care of your of your little man. congratulations, he is beautiful- but from such goodlooking parents he had to be. Congratulations! What a gorgeous wee man 🙂 I hope you’re recovering well and he’s feeding and sleeping well too, tho he looks pretty content there, so you’ll be doing a great job. What a fantastic year it’s been with your gardening, your gorgeous wedding to your lovely Hunk and now… the icing on the cake with the cutest, most precious wee acorn! Wishing you a speedy recovery and many, many more fantastic years to come! Take care. Your wee man is just gorgeous. I wish him and his parents all the best for the future and I hope it is a happy, healthy and green fingered one. What a great day to be born. My boy was also born on 7 June, although is now a lanky 13 year old, but he’s still as gorgeous and wonderful and as much fun today as he was when tiny. The time passes way too soon so my suggestion is, every time you think “that’s so adorable, I must remember that”, write it down immediately. Write it on the back of an envelope, or a scrap of paper, or put a reminder in your phone. Put the date on it. Seriously, otherwise it’s too easy to forget. My phone still has the date my boy said “delandelions” and it makes me smile every time I see it. Congratulations Lynda and Jason and Welcome to the world youngling. I am an avid reader of NZ gardener and have boxes and boxes of past copies although some I have given some away over the years. I have a vege garden I enjoy pottering around in and spend a lot of time pickling and bottling and finding a myriad of ways to preserve the spoils of the garden. My youngling is 18 in a couple of months and although he doesnt show any interest in the vege garden he is keen to start himself a rose garden this year. I think he thinks it will impress the girls and provide cheap flowers to present to them lol. Brilliant! You’ve clearly raised a very smart son! Lynda, I thought I had sent my congratulatons on the arrival of your darling wee man , but realised I hadn’t. Sorry. Enjoy every minute of being with him, because time goes so quickly. It is so special being a stay at home mum, being there to see all the changes— eg his first real smile, being there to see him roll over for the first time, his crawling, first tooth, first words etc. I now have three great grandchildren!! Am only in my mid sixties, It is so amazing to have them. Real Gifts.Gaynor Tait. Thank you – it is amazing how quickly the time goes. We’re getting the first cute wee gummy smiles now. He’s six weeks old already, which is great because that also means six weeks of winter have gone by without me noticing. Bring on spring! Hey Lynda – he’s very cute. Thinking of you being maternal is doing my head in a little bit, but I’m glad you’re loving it so far. Cheeky! But I haven’t forgotten how good you are at baby wrangling… I may yet call on you! He is just beautiful :-). Congratulations Lynda and Jason I am thrilled for you both. Lucas is such a precious wee boy. How special for you both venturing into the exciting adventure of parenthood. I’m very much looking forward to meeting Lucas sometime at the Farmers Market. I hope you have a speedy recovery from your C Section. Thanks Patricia. I suspect Lucas will see his fair share of farmers’ markets in the next few months… I’m hoping to sell my asparagus this spring. If we don’t eat it all, that is. Thanks – he looks like a real little man now. I’ll have to get him out in the garden for a new photo. awwww he is just so sweet! you’ll have him out helping you in the garden in no time! !